Island Escape Cruises keen to shake “best kept secret” tag. Auckland-based boutique small ship cruise company, Island Escape Cruises, is tiring of their status as one of New Zealand and Vanuatu’s best kept tourism secrets. Don’t be misled by Island Passage’s workboat-like exterior - it hides a meticulously crafted interior. At 42m (137.8ft), this ocean-going catamaran is equipped to access remote areas while delivering the highest level of onboard comfort. She hosts up to 22 guests in 11 spacious ensuite cabins, has a large dining room and saloon lounge and is fitted with rich timber panelling and superb New Zealand Kauri handmade furniture. In the galley, our expert chef works with fresh local ingredients and delicacies to create memorable meals that reflect the day’s adventures. The ship’s spacious outdoor living areas include a covered aft deck and huge upper deck which doubles as a helipad. Island Passage cruises the waters of the Marlborough Sounds in November, the Bay of Islands in January and February, the Hauraki Gulf in December and March before relocating north to the waters of Vanuatu from May through until the end of August. 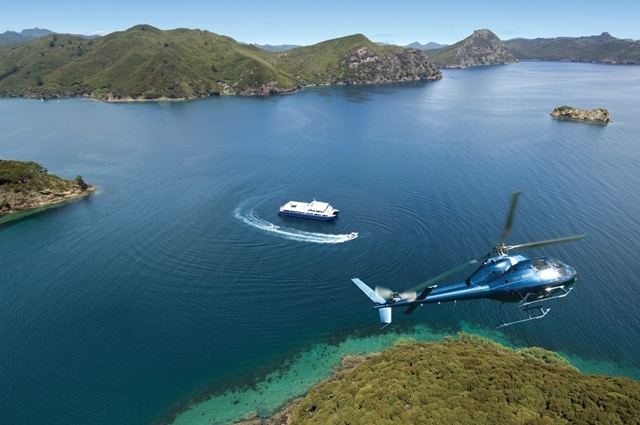 For entertainment and exploration, Island Passage carries purpose-built landing craft with walk on/walk off ramps, three large tenders, sea kayaks, a five-seater helicopter (New Zealand only) sports and game fishing and snorkelling equipment. Prices are all-inclusive and include all shore excursions superb cuisine, espresso coffee, tea, bottled water, juices and soft drinks, port charges, taxes, fees and onboard services. Alcohol and optional helicopter tours are extra.